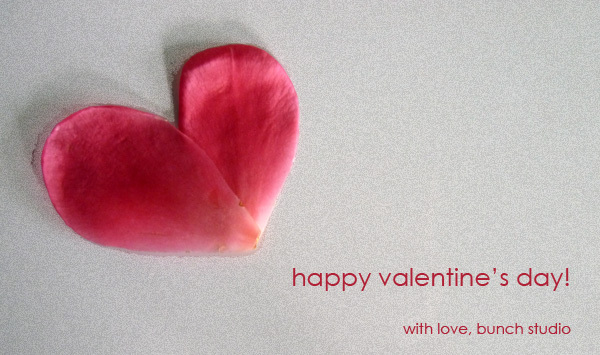 have a good one, lovers and friends. I have to share that the couple was very cautious of being environmentally responsible and chose to go with potted plants for their ceremony rather than using all cut flowers. 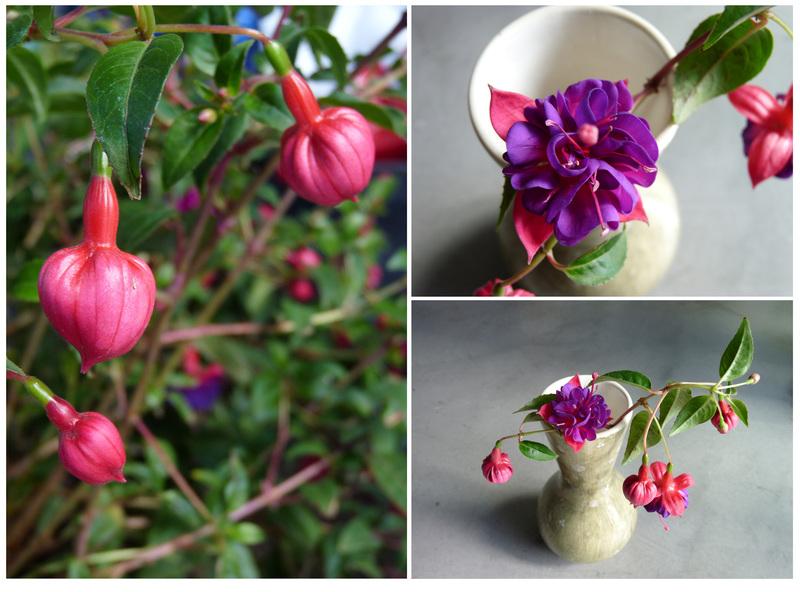 I was able to balance both worlds of planted and cut flowers with a very special pair of OohLaLa Bougainvillea trees which are almost Bonsai like and not the common leafy flowering shrubs with a variety of cut flowers on the bottom. The trees themselves had an amazing horizontal composition and I fell in love the moment I saw them… they fit in perfectly with the garden surroundings while maintained a special presence about them. I have been on a Bougainvillea kick for the past x months by the way… I just can’t get over their abundance of papery flowers or rich colors. They were also able to reuse the ceremony arrangements for their reception, along with the floral aisle runner & chair bunches… which is a great way to go. Thanks to A&M for allowing Bunch to be a part of their special day… and Thanks to William Kim Photography for sharing his work with us! I am in a terribly good mood, despite the fact that my good friend PNL just told me that my photos look cheesy (me, in general, and the non existent styling, not the photography). After expressing my hatred for him and his comment, I agreed and am again on the search for a photographer that can direct and make me look fab, dahling. I clean up real nice sometimes. So the other day(s) I had coffee ice cream for breakfast. In order for this to make sense, you must know three things: I have never in my life tried coffee ice cream before, I do not drink coffee (an occasional sip of black when there are desserts involved), and I have an extremely addictive personality. The moral of the story is that I require supervision. 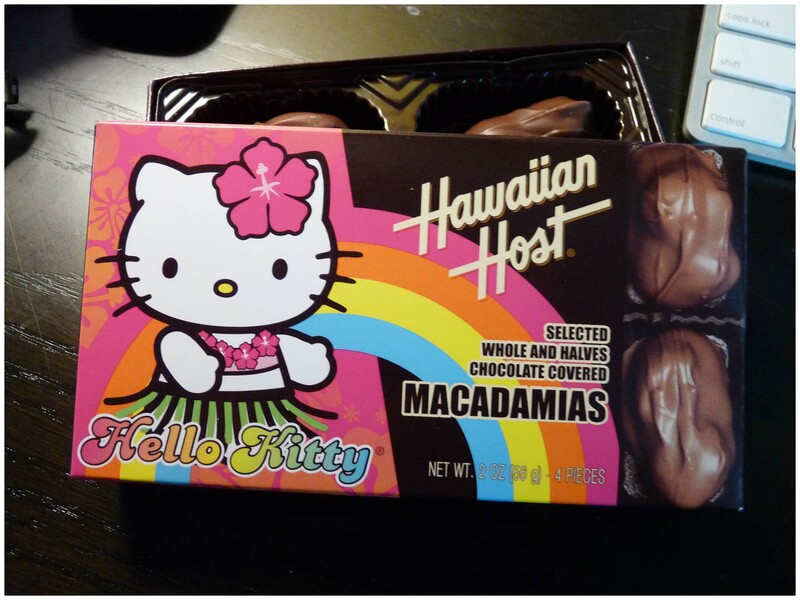 On a tangent, Chocolate covered macs are SO much better with Hello Kitty gracing the packaging don’t you agree? Thanks L! The other day I had a date with my girlfriend H. Aside from stuffing ourselves with delicious goodies LA has to offer & visiting the Annenberg Space (Water exhibit is currently going on and I recommend it to anyone and everyone), we also went to the flower mart where we started her Manzanita project. While most of the wedding industry has been there and done that, there are many that still pursue the beauties of this tree and really it is no wonder it is being used everywhere… each branch takes on its own personality and there are so many things you can do. What’s even more challenging (= fun) now is to do something truly unique that has yet to be done with them (I won’t pursue it but let me know if you do!). 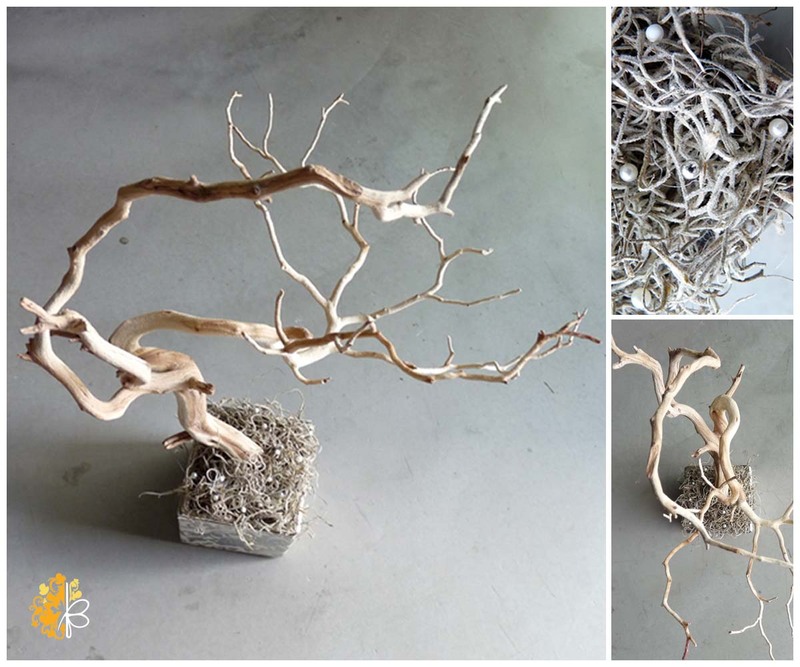 What innovative & beautiful designs have you seen done with manzanita branches? And I am currently working on a manzanita wall sconce for tea lights for her dining area. So last week i had a fun day with O, L & R. and we ‘had’ to go to Shareen’s to pick out some dresses for the photo shoot we recently did (pics to come!). not knowing what to expect & coming in with high hopes, we were met with walls & racks & racks of beautiful vintage clothing: laces & sheers, knits & furs, wools & satins… i was seriously in girly heaven. to be surrounded constantly by beautiful things, S W O O N. it’s exactly how i feel about design and great showrooms (such as Blackman Cruz, Kravet, and Environment Furniture just to name a few). i am absolutely the type of girl who can live in fancy tulle ballgowns and sweatpants, in an open space with all but 1 or 2 key pieces of distinguished furniture. i wanted to hug Shareen for having such a wonderful hidden space, and the best part was, no boys allowed! i wish we had all the time in the world to try on every single little number and romp around, but alas, that didn’t happen. Anyway, Shareen and her lovely employees were so extremely hospitable and helpful. They were on it! She accepted it with such grace and gratitude… i am absolutely smitten with this woman whom i’ve met for a total of 10 minutes… running her show the way she does, with such authority and sweetness and sleekness. i love it! again, S W O O N! 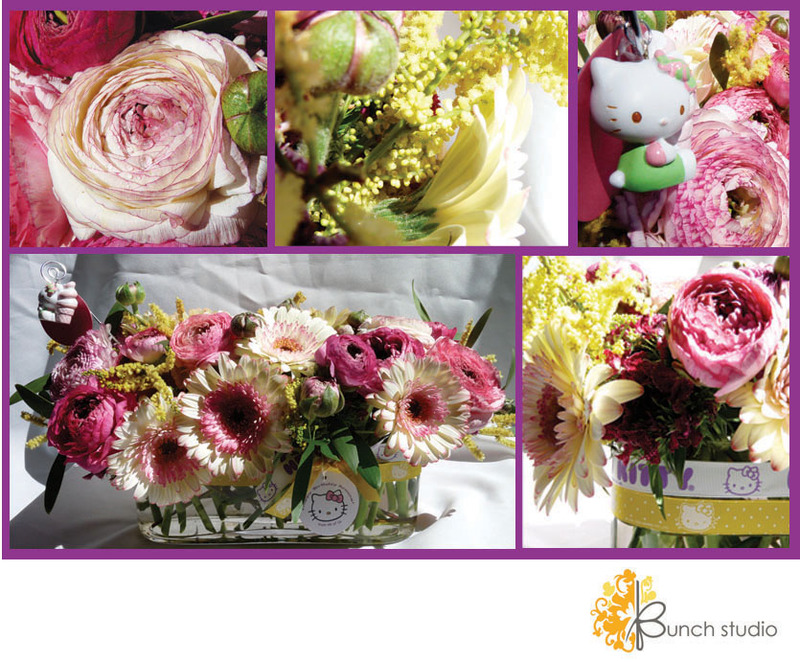 Fun Hello Kitty arrangements make me a happy camper. Let’s keep those orders and the like coming! 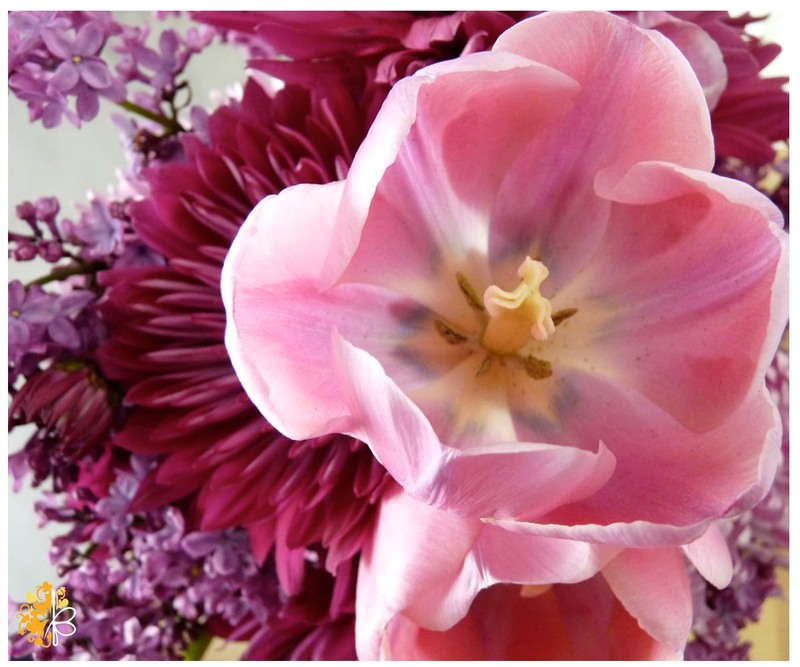 This weekend I am attending a wedding in Long Beach, then visiting a lovely venue in Santa Barbara for R&D’s wedding in June. I don’t think I’ll ever get tired of weddings or the search for inspiration. P.S. We have something exciting coming up in the next couple of weeks… stay tuned!